You've been invited to play the role of Indy Temple in Murder on a Train. 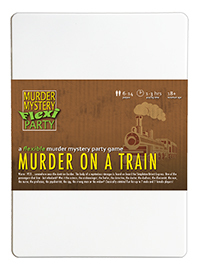 In the coldest month of 1933, somewhere near the Austrian border, passengers aboard the Simpleton-Orient Express experience a murder that will change their lives forever! But who killed mysterious stranger John Doe? Join us to find out whodunit! You are an archaeologist. Raiding tombs is a messy business so you wear a pale open-neck shirt with brown trousers and a brown leather jacket to keep the spiders off. A fedora, bullwhip and satchel for storing treasures completes the look. Following in your father’s archaeological footsteps from an early age, you picked up his inquisitive and competitive traits at the same time. You try to rest more and adventure less since losing your mother in a snake pit accident, and you’re still terrified of anything with a forked tongue to this day. I’m Indy Temple and I’ve got acrophobia. Sorry, wrong meeting. I’m a curator slash archaeologist. There’s a lot of beautiful old things around and I can’t wait to stuff them in my museum. I’m sad about John Doe. He seemed… normal, all things considered. Oh, if anyone’s seen an ornate goblet lying around let me know. And definitely don’t drink from it. I don’t know if it’s the real holy grail… yet.